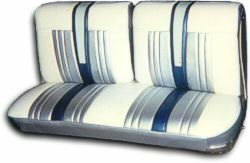 Catalina Custom Upholstery can provide you with an interior for your special automobile that will meet your needs. If you are building a custom Saturday night cruiser, an original classic muscle car or a vintage antique automobile, Catalina Custom can provide solutions to meet design taste, inovative ideas, problem solving and budget considerations that will compliment your efforts and investment. This is the type of car that usually has the most potential for a customer to really express their creative ideas. It is also the type of project that has the best possibilty to have to overcome unexpected problems. This is where Catalina Custom has the reputation to help guide the consumer with the creativity of their interior and solve the unexpected problems. Catalina Custom can also guide the consumer with the different types of materials to use for the custom interior. Types of materials, combinations of different types of materials, colors schemes, designs and material cost are all discussed throughly in detail. Material samples are shown and (when possible) large samples are provided. Large samples are nice to be able to better see color and pattern and to be able to feel the material. For information on the different types of materials used in the construction of interiors - click here. Vintage antique auto interiors is an area that Catalina Custom Upholstery can provide you with a wide variety of options to meet your taste and budget. In the construction of an original interior for one of these fine automobiles a wide range of materials is available such as leather, Mohair, Wool Broadcloth, Bedford Cord cloth, 100% cotton knap headlinings, vinyl and toppings. Non- original, modern type materials can also be used to produce interiors that are in the nature of the antique look while holding the cost down. Every effort to the best of our abilities is pursued to meet the needs for your project. There are automobiles that are not as popular as others, and thus are not profitable for vendors to produce original interior kits for them. This is when you need to have an upholstery shop to take that extra step and try to come up with answers. This is where Catalina Custom has been able to take that extra step and provide solutions to unique problems through nation wide contacts and research working one on one with the customer providing the best product possible. Visit our Showroom Gallery for examples of the many types of interiors produced by Catalina Custom Upholstery over the years and for further inquiries contact us.